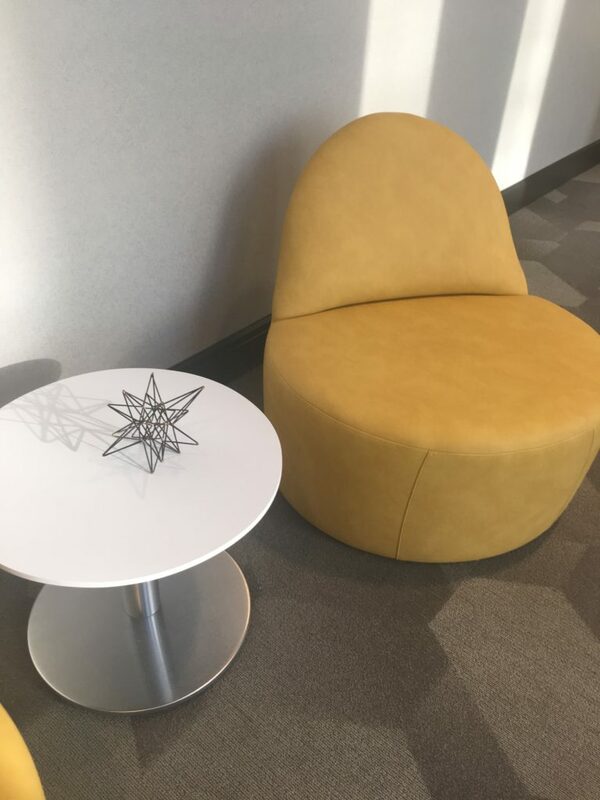 Marriott at the University of Dayton has had an overhaul that we have been seeing across the Marriott brand. Long gone are the days of bold rich reds, golds, and purples. Hello, are the days of a modern edge with a personalized twist paying homage to the area. The redesign celebrates Dayton’s rich history of flight experiencing tributes to Orville and Wilbur Wright’s first plane design. 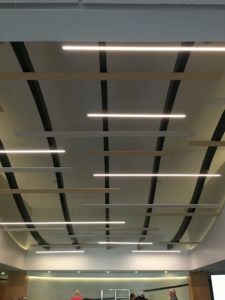 As you walk in the front doors, the ceiling is notable as it offers depth and an aviation-like flow to the front desk. Throughout the property you see rounded lines, rich woodworking, and a neutral palette with accents of rich blues and green plants. 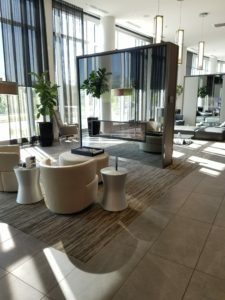 I enjoyed seeing all of the working areas, nooks to relax in, and the business center. Everything is comfortable and open with an undoubted sense of pride for the city of Dayton and its’ history. 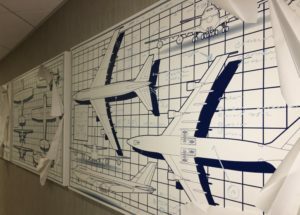 One of my favorite art pieces was the plane blueprint artwork that sat behind a working area, a three-piece installation that is a creative addition. What once was Sharkey’s and an amphitheater is now a relaxing courtyard with outdoor seating. 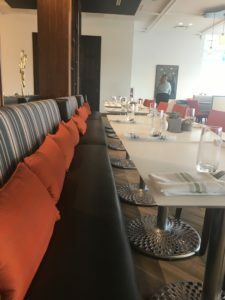 In addition, their restaurant got a full makeover and is now called Dewberry 1850. The restaurant is beautiful, bright, and open and is accessible easily from the entry. The bar within serves up coffee shop beverages by day and transforms to a bar by night. The menu features American classics served up fresh with a twist. While we were visiting, I did try their special coffee beverage, an iced Blackberry White Chocolate Latte, it hit the spot on a humid morning! 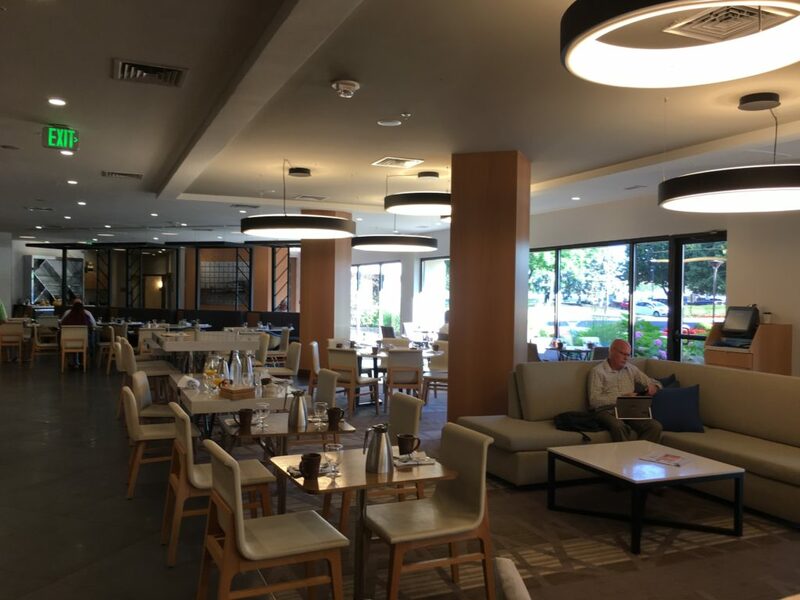 The Marriott at the University of Dayton has certainly undergone a fresh redesign and will continue to serve the Greater Dayton community for years to come. From the outside everything is seemingly the same and pristine as ever. Once you walk through the doors, a very sophisticated modern story unfolds. 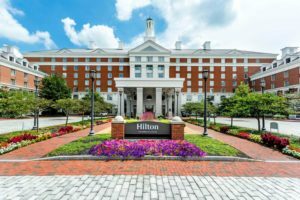 All of the qualities Hilton Columbus at Easton is known for have remained: exceptional service, delicious food, and uncanny attention to detail. Through the front doors and into the main lobby we go! Ah, what a space! 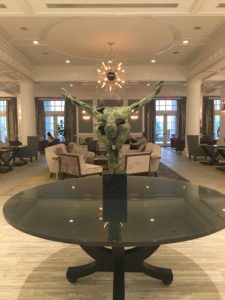 The front desk, soft seating (and a lot of it – there is also extensive outdoor patio seating available), and the bar and lounge is wonderfully welcoming and simply put… stunning! 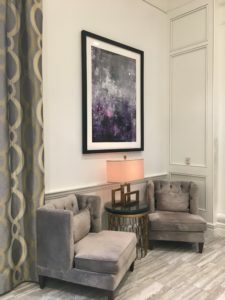 Lovely shades of gray with accents of chartreuse green and purple hues make a great combination. 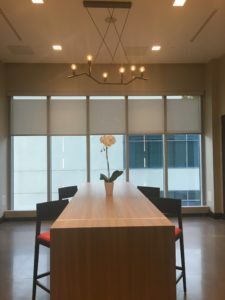 I have a few blog posts under my belt now, and I am sure you have learned, I love light fixtures. 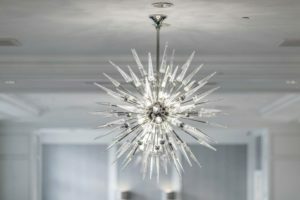 Throughout the lobby and pre-function spaces shiny silver and crystal-like shapes draw your attention. They truly make the spaces and they are unique! I also love food and am all-in for the new concept being offered, Herb-n-Kitchen. Serving Starbucks beverages, an array of freshly crafted salads, sandwiches, & flatbreads, and all the market snacks to go along with it (inclusive of Jeni’s Ice Cream pints!). When, I travel, especially by myself, I always appreciate an option like this! 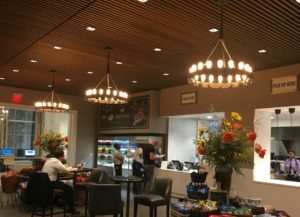 Don’t worry, you can still order delicious menu options in the lounge along with your favorite cocktail (try the cucumber mint mule!). DISCLAIMER TO OUR SPORTS FANS: Easton Sports Club, formerly inside of Hilton Easton, is no longer in business. RIP. 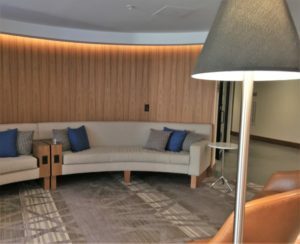 It is easy to see that this was a renovation of intent, an intent to make the guest experience enjoyable and easy. 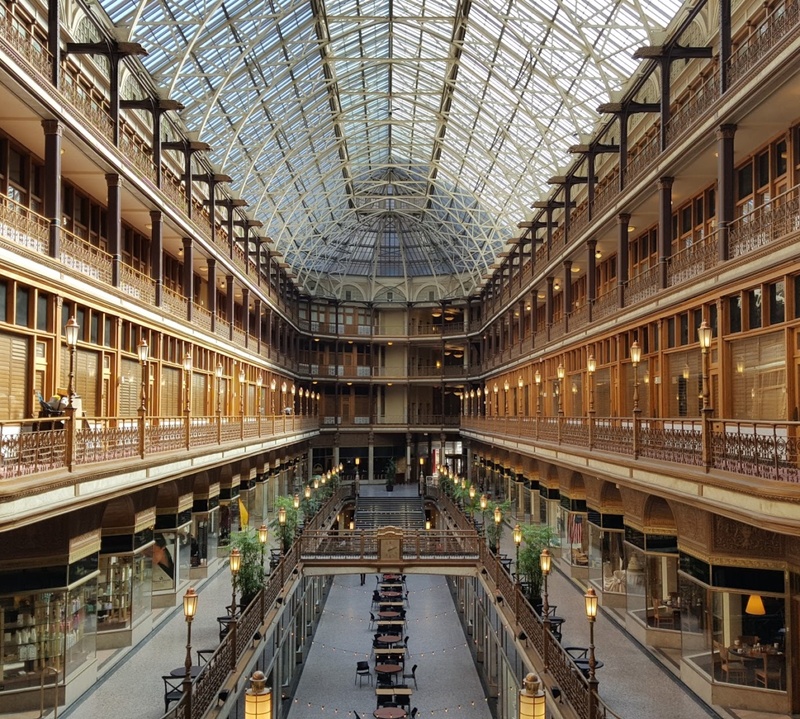 Next time you are at Easton Town Center be sure to visit the Hilton and see it for yourself! P.S. I didn’t get to stay the night but check out these sleeping room photos below! 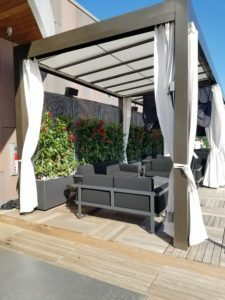 When you’ve spent lots and lots of time inside changing diapers and working on organized tummy time on a proper flat surface, it makes you jump at a chance to hang out with adults doing adult things, like tapas and summer cocktails at a rooftop bar. makes you crave a handcrafted cocktail before you even make it through the threshold and you can hear the buzz of conversation from the open lobby concept, offering cozy places to have private conversations or quick business meetings. Once you make it past the lobby, you head to a separate entrance for the exclusive rooftop bar… So let’s go. 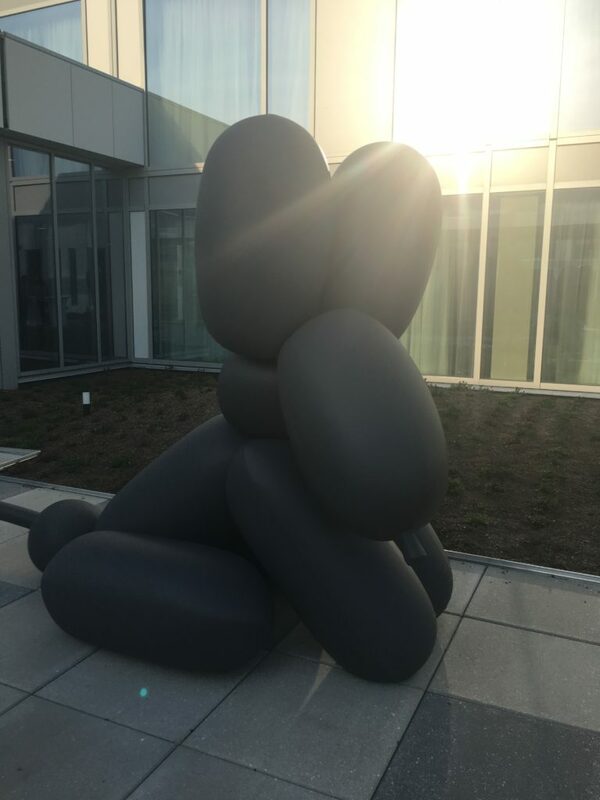 I’ve only been in 3 AC Hotels, but all of them have a cool outdoor experience. 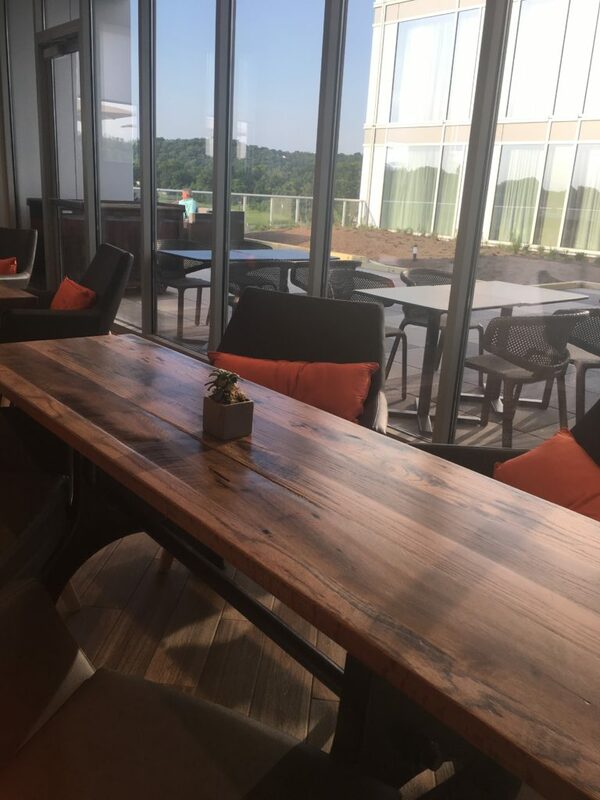 The rooftop bar concept is taking Columbus by storm, but fortunately VASO got in and set the bar high from the start. 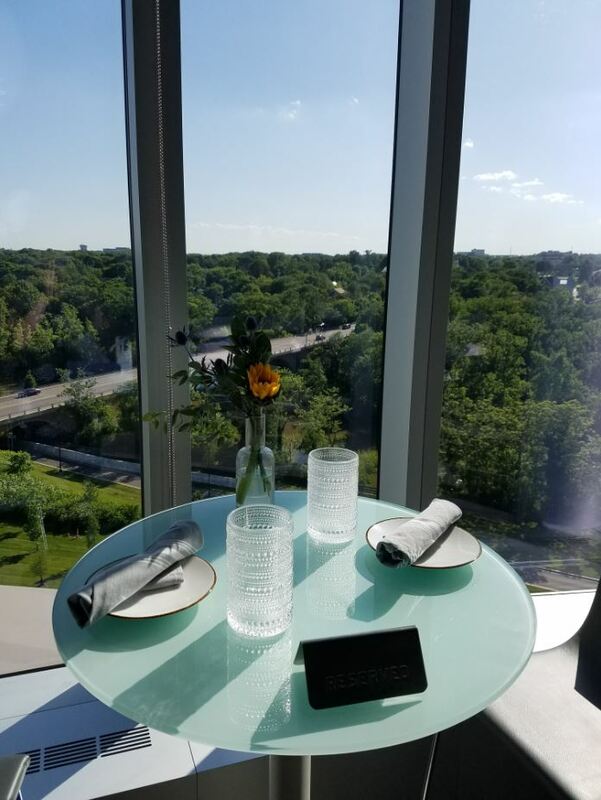 The glass elevator sweeps guests up to the 8th floor where you’re greeted by a friendly host, who is hoping you have a reservation, because my guess is walk-in availability is slim here. We were visiting on a Sunday evening after the Muirfield Memorial Golf Tournament which brings in celebs like Tiger Woods, Rory McIlroy and Phil Mickelson. Needless to say, the place was PACKED. Luckily, we made reservations about a month in advance (totally not necessary, we were just busy having a baby so you know, options are limited). Once you can look past the number of people who also thought a rooftop bar in the summer would be a good idea, you see that amazing view. VASO is serving up Spanish-style tapas and handcrafted cocktails. Our group ordered the San Jacabo (waitress recommendation and my favorite), Patatas Bravas, Albóndigas de Cordero, Ceviche de Vieiras and Ensalada de brotes de Bruselas. Of course, no meal would be complete without dessert. I had the Torta de Santiago, but honestly, TJ’s Torta de toffee y dátiles was absolutely amazing. Whether you sit inside or out, guests can enjoy the tapas menu with impressive views, cool music and delicious cocktails. If you haven’t been yet, I highly recommend a visit. If you’re there on a Thursday-Saturday, there is a dress code. Kind of old school, but I like it. Embrace the exclusivity, because at this rooftop bar, you’ll feel like you’re on top of the world. 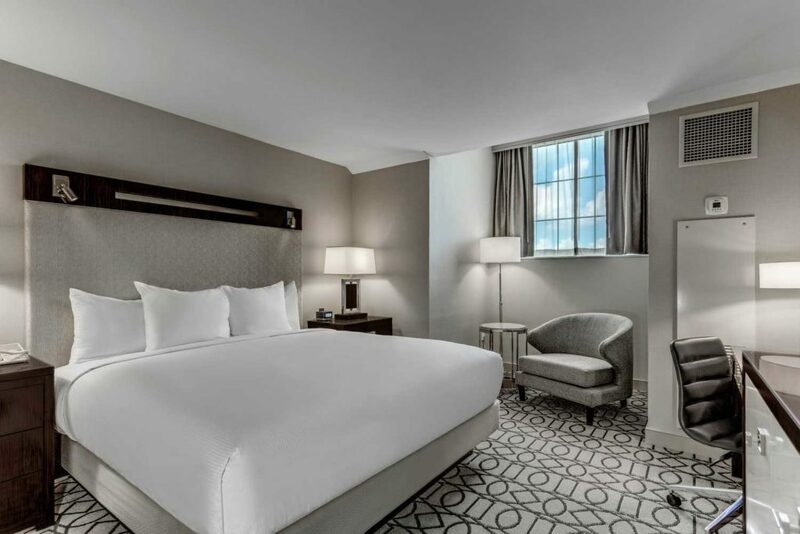 And why not make a night out of it an enjoy the accommodations at the AC Hotel Dublin? I was honored to be a part of The Summit’s Grand Opening celebration and am so happy I attended. The morning after, we (OHLA) hosted our Greater Cincinnati Lodging Council meeting here too. I got to be a guest and a host within 24 hours! Let me tell you, The Summit, knows how to throw a party. 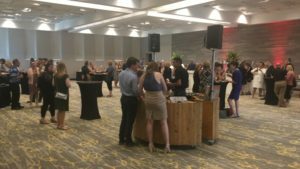 From the lobby to the 4th floor restaurant and event space, there was action. 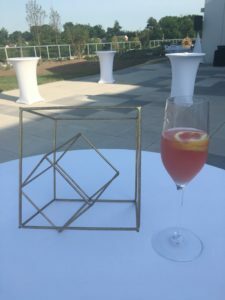 The staff was certainly on their toes for the event but I could easily tell they were thrilled to have guests and their hospitality was outpouring. 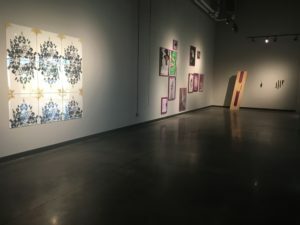 At the time of my last visit the art exhibition event space had no art quite yet. They do now! I walked through and took a peek and took a few photos to share with all of you! I just love that this is inside of a hotel. 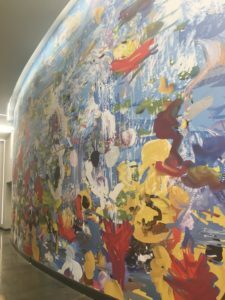 After checking out the art, I continued to walk through the lobby to their first floor nourishment hub of sorts. It was decorated with Victorian styled hats, reminiscent of a vintage tea party. Here they had a local tea company featuring their hot beverages along with mini bundt cakes (Nothing Bundt Cakes, of course!). Though I was enjoying my time wandering around the first floor, from what I heard, the main event was in their ballroom. I hopped onto the speedy elevator and up to the 4th floor I went! I was greeted with a cocktail, lovingly named Maxine. (Remember, I mentioned Maxwell? We are getting there.) It was a local twist on the classic French 75. After trying EVERYTHING, it was time for bed. I moseyed into my room and realized there was something new in my room (Pay Attention! This is about Maxwell.) that I did not have during my last visit. 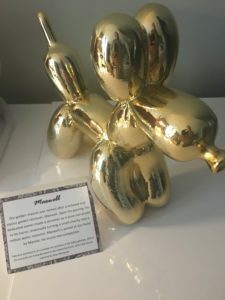 Maxwell, the cutest gold statue of a balloon animal dog. Rise and shine! The next morning, I went to breakfast in The Market which offered so many amazing choices including salmon, strawberry French toast (Yes, topped with cream and fresh strawberries! ), eggs, and the list goes on. Sadly, I am relatively boring, and had fresh fruit, yogurt and coffee. Our meeting was soon underway and I cannot say enough about the attentive team! 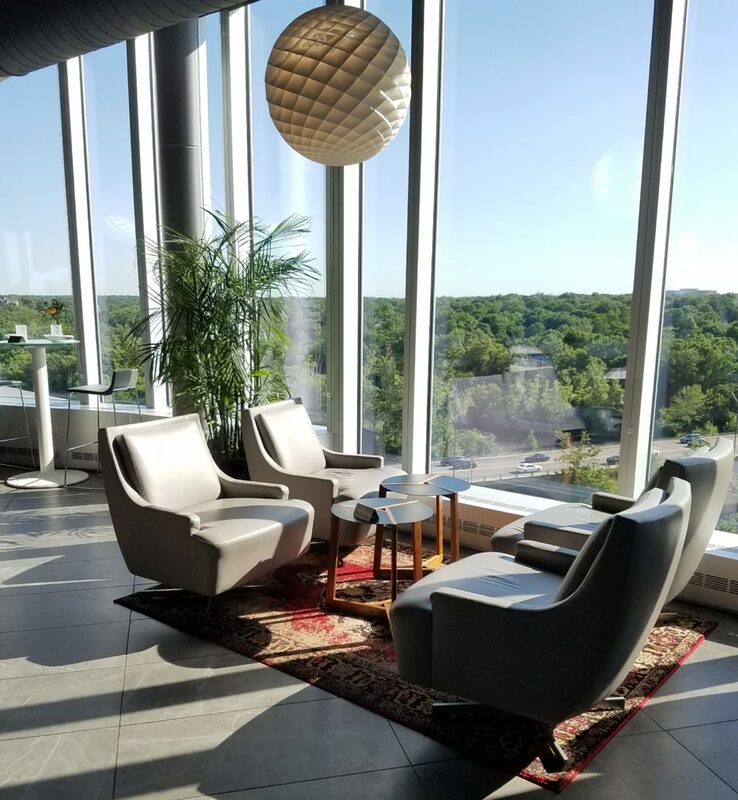 Our space was perfect with a lot of windows and natural light. I am thrilled to have had the opportunity to visit The Summit again and take it all in. 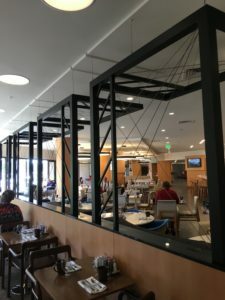 I still did not get to dine in their (now open) Overlook Kitchen & Bar, however, it looks like I have an excuse to start planning my next visit! My husband (Sean) and I booked it to Yellow Springs last week after a long work day. Though there was an accident, we still managed to make it to Yellow Springs in just over an hour (phew!). We had one night in Yellow Springs and we planned to jam pack it with all that this quaint town had to offer. 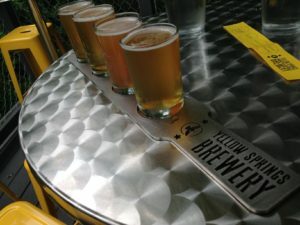 First stop, Yellow Springs Brewery. We pulled into the gravel lot and got all the smells from the food truck parked just outside, yum! The brewery itself is vibrant and full of energy. Their colorful logo hung above the draught spouts and my husband immediately requested a logo sticker to take back to his man cave refrigerator (of course!). We settled in and got a flight to taste all the options. 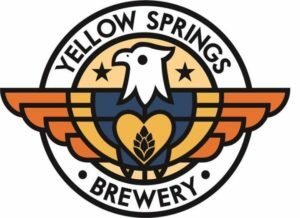 We enjoyed the staff, the local gentleman sitting next to me who shared his story of how he got to Yellow Springs, and of course, the brews! We were quickly on to our next stop, Winds Café, for dinner. We were seated at a table beside the windows that looked out onto Xenia Avenue which invited Sean and I to take in the community. 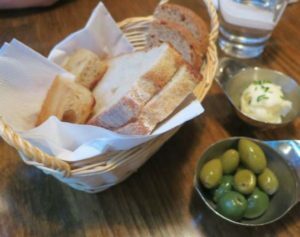 Before we ordered fresh breads, house olives, and creamy butter were brought to our table. We went on to order a Caesar salad, stuffed calamari, and the seasonal risotto. (I like to say that Sean is a Caesar Salad Connoisseur of sorts as he always must order one if there is one to be had. He was thrilled that he didn’t have to ask for anchovies, they were already included! It’s the little things…) Everything was delicious, but don’t worry, we both saved room for our next stop… Young’s Jersey Dairy. I am all about ice cream. I love ice cream, especially if there is chocolate and peanut butter involved. We were told by several friends that we HAD TO stop at Young’s Jersey Dairy for ice cream, boy, am I happy we did! Sean went for the good ‘ol mint chocolate chip and I did the Buckeye Sundae (chocolate and peanut butter ice cream, hot fudge, whipped cream, and a homemade Buckeye… heavenly). 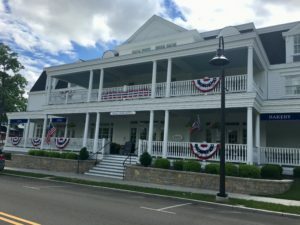 By this point, we needed a good night’s sleep at the Hearthstone Inn in nearby Cedarville, a well-appointed clean and comfortable stay with a personal touch from the owners’ in every way. 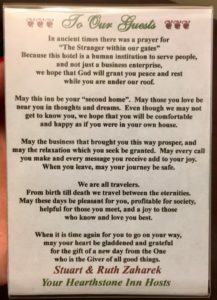 I thought this travel blessing was a sweet touch (see pictured). The next morning, Sean headed back to Columbus and I had the opportunity to visit with one of our Unique Lodging of Ohio members, Mills Park Hotel. Talk about a hotel with personality! 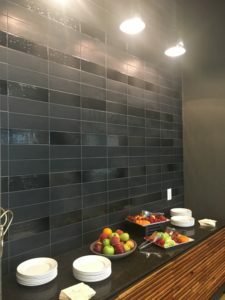 The property is modeled after the 19th century home of William Mills, a local settler who had helped in the development of the town’s infrastructure. 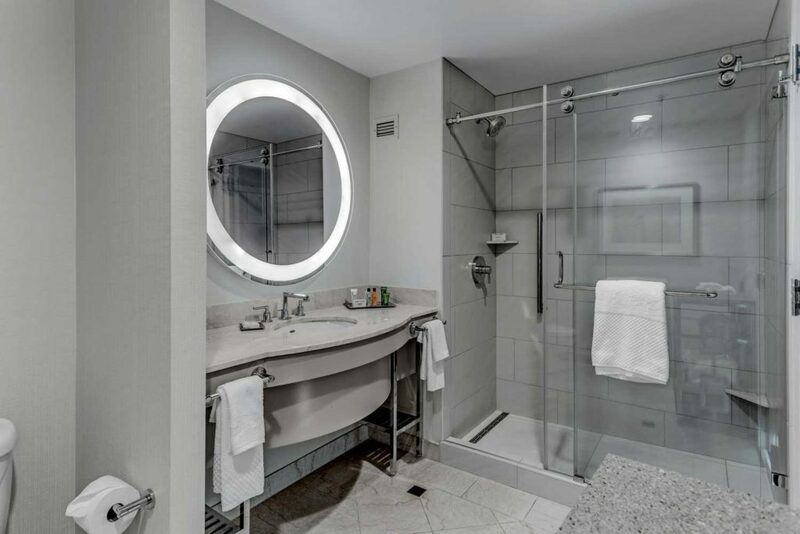 Mills Park Hotel gives a modern twist to their historic roots. The front wrap around veranda is welcoming and completely charming! 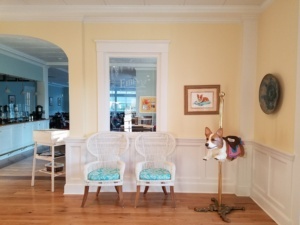 Throughout the hotel there are darling paintings of CORGIS (yes, the adorable fluffy dog), a corgi carousel, and corgi stuffed animals in the gift shop! (Fun Fact: the owner of the hotel has a corgi, hence the significance. 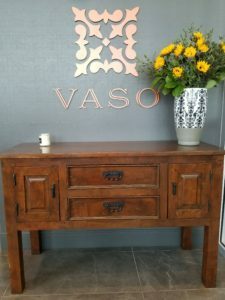 In addition, he is fantastic with woodworking. Throughout the hotel, several of the wooden pieces were handcrafted by him!) I enjoyed an excellent breakfast in Ellie’s Restaurant & Bakery (the breakfast croissant was delicious!) and then I had to bid adieu and off to work I went. Every stop during my time in Yellow Springs is memorable and I’m looking forward to returning and staying for a while. I hope to explore the art scene and the several locally owned shops that line Xenia Ave. From what I hear, you must come during a Street Festival (I’ll have to check my calendar…).